Dr. Barrett studied medicine at the Schulich School of Medicine & Dentistry at the University of Western Ontario. She subsequently pursued residency training in internal medicine and adult critical care medicine at the University of Toronto. She has a Master’s of Science in Health Policy, Planning & Financing from the London School of Hygiene & Tropical Medicine and the London School of Economics, and received the Brian Abel Smith Award for both her dissertation and course work. Her research is focused on the cost-effectiveness of critical care programs and delivery, as well as evidence-based policy development. 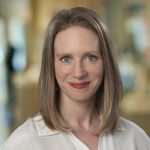 She serves on the Ontario Health Technology Advisory Committee at Health Quality Ontario, which reviews the economic and clinical evidence for health technologies and makes recommendations regarding whether they should be publicly funded in Ontario. Reassuring Long-Term Outcomes for Australian and New Zealand Survivors of Severe Influenza A (H1N1) Infection. A Case Study in Methodological Complexity? Barrett K, Fan E. Ann Am Thorac Soc. 2015 Jun;12(6):794-5. Predicting neurologic outcome after targeted temperature management for cardiac arrest: systematic review and meta-analysis. Golan E, Barrett K, Alali AS, Duggal A, Jichici D, Pinto R, Morrison L, Scales DC. Crit Care Med. 2014 Aug;42(8):1919-30. Surrogate decision makers’ attitudes towards research decision making for critically ill patients. Barrett KA, Ferguson ND, Athaide V, Cook DJ, Friedrich JO, McDonald E, Pinto R, Smith OM, Stevenson J, Scales DC. Intensive Care Med. 2012 Oct;38(10):1616-23. Epub 2012 Jul 24. Considering the vulnerabilities of surrogate decision-makers when obtaining consent for critical care research. Barrett KA, Scales DC. Intensive Care Med. 2012 Jan;38(1):4-6.